Assam Forest Admit Card Download 2018 & PST & PET Result of Special Tiger Protection Force PST & PET, Written exam admit, Biometric verification. DOWNLOAD HALL TICKET/ADMIT CARD FOR THE WRITTEN TEST IN CONNECTION WITH RECRUITMENT OF 90 POSTS OF SPECIAL TIGER PROTECTION FORCE (SPECIAL RHINO PROTECTION FORCE-SRPF) CONSTABLES FOR KAZIRANGA TIGER RESERVE (KTR ) IN PURSUANCE TO ADVERTISEMENT DATED 29TH JUNE,2017. As per guidelines of advertisement dated 29th June 2017 the following is the list of selected candidates for written test in connection with the recruitment of 90 posts of special tiger protection force (special rhino protection force-SRPF) constables for Kaziranga tiger reserve (KTR). Candidates will be able to download admit card for written test from Assam police website www.assampolice.gov.in with effect from 6-02-2018. The lists can be also seen on the Assam police website www.assampolice.gov.in. Biometric verification will be done before the written test. Candidates will have to appear for their written test at the venue(s) (schools/colleges) shown on the admit cards. They should report at the venue on 25.02.2018 at the time as mentioned in admit card. Don't Miss to Read: Assam Police Admit card Download. Qualified Candidates will be called Biometric verification and thereafter they will be required to appear in written exam. The Physical Standard Test & Physical Efficiency Test (PST & PET) for the recruitment of 90 posts of Constable of Special Tiger Protection Force (Special Rhino Protection Force - Srpf) in pursuance of the advertisement published on 30.07.2017 will be held w.e.f 08.12.2017 at Bokakhat Rajahua Khelpathar, Bokakhat, District - Golaghat. Qualified Candidates will be called for Physical Standard Test & Physical Efficiency Test (PST & PET). 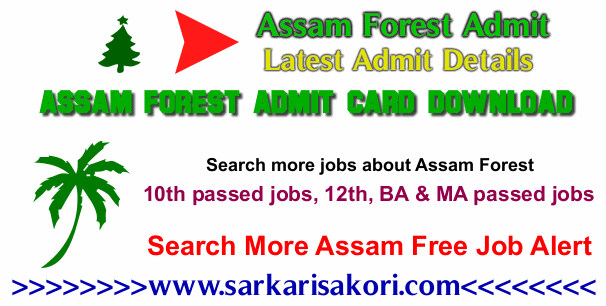 You will be interested more info about Assam Forest Admit Card Download 2018.